What is an electric heat pump? Think of the way your refrigerator removes unwanted heat that accumulates when you open the door and place warm food inside. You can feel that heat coming back into the kitchen from the refrigerator's exhaust fan. In a similar way, a heat pump simply extracts the heat that's present in outdoor air in winter and delivers it inside your home to keep you warm and comfortable. In summer, the process reverses. The heat pump pulls the heat out of indoor air and releases it outside to keep your home cool and dry. A heat pump's ability to both heat and cool makes it a very economical and efficient home comfort system. A special liquid called a refrigerant circulates between the indoor and outdoor units, absorbing and releasing heat as it travels through the loop. What are the parts of an air source heat pump? A typical heat pump installation consists of two parts: an indoor unit and an outdoor unit. The indoor unit is called an air handler and looks similar to a gas furnace. The outdoor unit looks exactly like a central air conditioner in both size and appearance and contains the compressor. Regardless of whether the heat pump is heating or cooling, the compressor is considered the "heart of the system" because it is the pump that circulates the refrigerant through the loop. Because of its importance, experts recommend that you look closely at the compressor's reputation and warranty when selecting a heat pump. 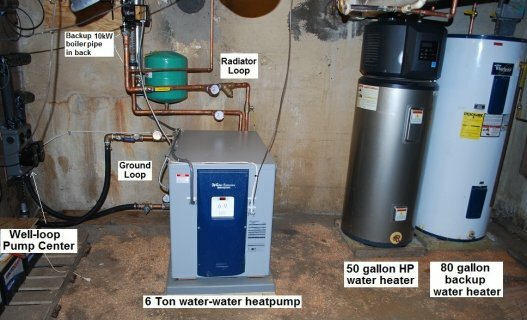 What is the difference between air source, geothermal and water source heat pumps? Instead of using the surrounding air, a geothermal heat pump uses the energy from the ground. Similarly, a water source heat pump uses water (a pond, lake or the ocean) as an energy source. Probably the most basic is the difference between the temperature of the heat source and the temperature at which the heat is delivered. The larger this difference, the lower the efficiency. For the ground source heat pump, the temperature of the ground is warmer than the air during the coldest part of the winter and colder than the air during milder weather in the spring and parts of the fall.